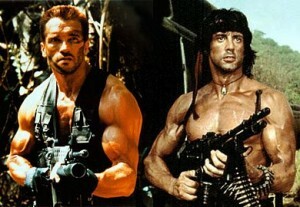 Stallone & Schwarzenegger To Team Up For ‘The Tomb’??? Mikael Håfström is currently in talks to direct Sly Stallone in ‘The Tomb’ for Summit Entertainment. Mikael is known for directing ‘1408’, ‘Derailed’, and ‘The Rite’. Mostly horror thrillers. The film is happnening but has been held up for a bit due to some production issues with Stallone being in Bulgaria on another shoot. And Schwarzenegger has been approached to co-star in the film as well. Although Arnold has been approached to co-star, that’s about as far as it’s gotten. At one point Arnold was considered as the lead for the film, but Stallone took over. And even before that, Bruce Willis was set to star with another director, but that all fell through. Stallone plays a man who has designed a high-tech prison that is said to be escape-proof. When he is set up and sent to the prison he created, he essentially must go up against himself to escape and find retribution. So not much else is known at this time about the film or who will be starring, but Schwarzenegger seems like it would be a perfect fit. I don’t see why he wouldn’t do it. Your thoughts? Expendables Sequel Going to Happen!!! Find Out Who The New Guy Will Be!!! Sylvester Stallone, Jason Statham, and James Franco Team Up For Action Film!!! This entry was posted on Thursday, January 12th, 2012 at 12:52 pm	and is filed under News. You can follow any responses to this entry through the RSS 2.0 feed. You can skip to the end and leave a response. Pinging is currently not allowed. « Bill O’ Reilly Book ‘Killing Lincoln’ To Be Made into Documentary By Tony and Ridley Scott!! !